It’s almost Flea Market time! Flea markets are magical places to me. we’ll find something precious to take home! Every first weekend of September, we have this tradition. 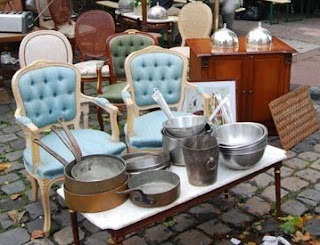 We go to the big yearly flea markets in Lille (France) and Kemmel (Belgium). We always go with an organisation named Antique S-hopper. They organize these weekend trips to France, Belgium, Germany and England. And they are inexpensive so you can spend your money on all the goodies you will find. We love that we can just sit, chat, drink coffee and that we don’t have to drive ourself, look for a parking spot on the edge of the city or wondering how we shall take it back home with us. Nope, we just put everything in the big coach Harry (that is the sweet organiser) rents for the day and we enjoy! the Netherlands or Belgium: go check Harry out! Tell him I said ‘Hi!’ and I’ll see you later in the bus! WE ARE GOING AGAIN TO FRANCE AND BELGIUM! I look forward to it, my plane ticket was booked months ago! 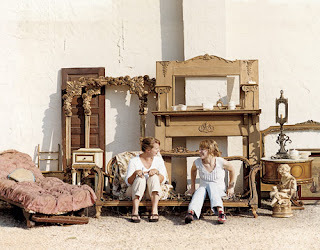 And if you love flea markets like I do, you are doing a green job! No, it’s no typo, I mean green. Green as in helping the environment. Recycling and Flea markets are holding hands, like two people in love. And they are going strong! We Reduce, Reuse and Recycle while doing something that we love! In my house, the perfect treasure will be welcomed by Sweetheart with his special look (rolling with his eyes) if the treasure is something big. Luckily for me he doesn’t mind me bringing home these recycled goodies. Yep, it’s almost this time of the year again! Recycled is beloved to me. You have yourself a grand time now! Hope you have a wonderful time … please do share with us your lovely finds. Dat klinkt heel gezellig Maureen! Het lijkt me super om daar eens rond te struinen! Geniet ervan en ik ben benieuwd wat je daar allemaal scoort! Oh yes here is another fleamarket lover!!! You and I would have a great time together, hihi! My darling husband is also going to Lill this time! Lucky him! Thanks everyone for your comments! I heart blogging! Thanks Susanne, I will check that out and Desiree, I loved your photo’s! Have a good night sleep, I know I will now! I want to say hello first and them I’m going back for more of your beautiful blog. I think we have the same heart for the hunt! This just amazes me, you in Switzerland and me in Florida! I love this blogging thing. Anyway, I don’t know what Tubir is or susiebee, is that a blog? Wat leuk je blog !!! ik volg je nu….en kom zeker gauw terug….neem aan dat ik Nederlands kan schrijven?? ?…Groetjes Ria…. Ja leuk doe dat ! !…kies een leuke foto en ga je gang…..en wil jij je adres doorgeven ?? als 350 ste volger krijg je een kadootje !! !……je kan dat doen via de webwinkel……daar is een optie heeft u vragen ?? en daar staat het mailadres…….leuk allemaal weer…fijne avond nog….liefs Ria…. Hi Maureen! Thank you so much for passing by…It’s a pleasure to meet you! I wish you good luck with your new born blog, it’s a lovely experience, you’ll see. He Maureen! Lees ik het nu goed? Heb je die tafel gekocht waar je het over had? Ik vind je blog heel leuk, ik zie je helemaal voor me als ik het lees.